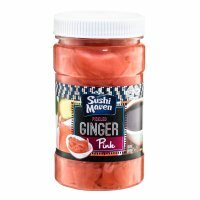 Sushi Maven Pink Pickled Sushi Ginger 12oz [RETG] - $3.10 : SushiMaven.com, Your Source For Everything Sushi! As you're stocking up on sushi supplies, don't forget its most flavorful counterpart. No sushi meal is complete without the most pleasing palate-cleanser: sushi ginger. Pink and pearly, this delicate sushi ginger root is not only appealing to the eye, but it also brings a refreshing cleanliness to the mouth in between bites. Sushi ginger is an essential part of the sushi-eating experience, so don't forget to add this cleansing condiment to your sushi supply list. It can also be used with any main dish you are serving. In addition, pink sushi ginger is rich in antioxidants!